Was Eugenics Science or Racism? Reviewing my exams at the end of my WWII unit made me realize that my students didn’t really understand why Hitler easily rose to power in Weimar Germany. They had no inkling how he used popular science to advance many of his racial theories, nor that Hitler stole most of his theories on racial purity from American scientists in the eugenics movement. These students did not understand that eugenics was the 1900s equivalent to climate change, widely accepted by the mainstream, but vilified by extremist groups. I blame this, not on my usual frantic sprinting along the historical coverage treadmill, but on our textbook, which doesn’t even mention the word eugenics anywhere in its 793 pages. Instead of re-teaching all of WWII, I put together a quick three-day unit and argumentative writing assignment on eugenics, starting with this wonderful lecture from 15 Minute History. The next day, my students opened class with a Do Now: (quick write) that asked: Did the eugenics movement benefit or harm society? 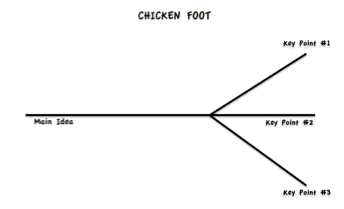 Then, I gave a short demonstration on how to use a Vee Diagram when writing an argument. After writing their initial argument, the students participated a gallery walk where they collected at least six pieces of evidence. The idea of the gallery walk was to see if their minds changed after examining the evidence. 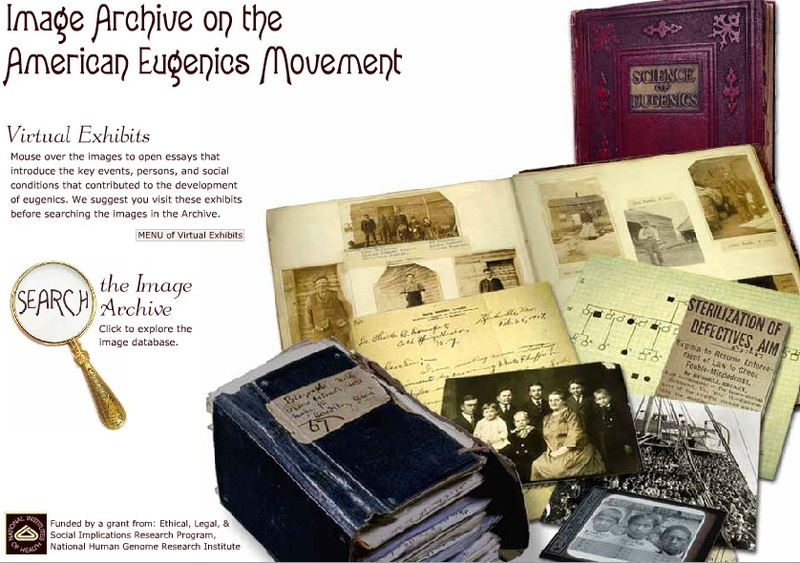 All of the materials in the gallery walk were collected from the Eugenics Archive. For their Exit Ticket, students discussed which pieces of evidence they had collected with an elbow partner and described how the evidence supported their claims. That night for homework, they were asked to fill out their chicken foot and organize their evidence, so they could write their essay in class the next day. 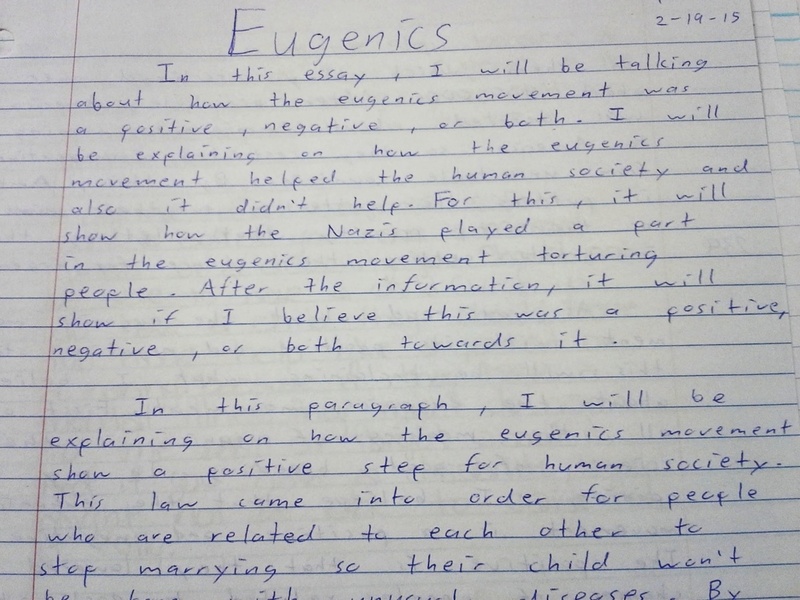 For their in-class essay, students were asked: Was the eugenics movement positive or negative? They were asked to include a brief background on eugenics, as well as their definition of eugenics, and instructed to write in the third person. Lastly, I asked them to use MEAL paragraphs to explain how their evidence supports their claim. Click here for additional information on MEAL paragraphs. L – Link: Explain how the paragraph fits into what the paper is trying to argue. The students (N=142) who completed this task, wrote an average of 292 words with 2.7 claims and 1.6 counter claims. At this point in the year, they should be writing between 300-400 words in a class period. To my horror, I discovered many examples of the Jane Schaffer method thriving in my class after a whole semester of trying to break them of the habit. I suppose I should be grateful that they had some writing instruction in middle school, but in high school and in college this type of writing doesn’t work. My next post will show students how to use the third person and help them learn how to turn bad writing into good writing. #TeachWriting Chat on Historical Writing. On Tuesday, February 10, 2015, I was the Guest moderator for the Twitter Chat #TeachWriting on Historical Writing. You can read an archive of the chat. The questions and resources I shared are posted below. Welcome to tonight’s #TeachWriting chat on Historical Writing. Please introduce yourself, including subject and grade level. Participating in Chapman University’s Holocaust Art & Writing Contest is always the highlight of my year. I get inspired by the amount of deep thought and hard work that my students put into their projects. This year, students were required to watch and submit notes on three separate survivor testimonies. Then, they created a piece of art, an essay, and a poem based on each testimony, and provided statements for the art and poetry pieces that described how their entry addressed the contest prompt. I assumed that their essays would address the prompt, which was not always the case. Too many students disregarded the prompt and simply summarized the survivor’s testimony without making any meaningful connections to the survivor, which disqualified them from the contest. My mood was foul. LISTEN. As you listen to the testimony, choose a moment of discovery for the survivor or rescuer. Give careful attention to the historical context in which this discovery occurs. Consider the effects of this discovery on the person and his or her actions. INTERPRET. From your own history, recall a moment when a discovery sparked in you the decision to act, to find your voice or to approach a situation differently. CONVEY. Drawing upon both your history and the history provided in the testimony, convey in an original work of art, film or writing the relationship between discovery and action. This was a difficult prompt for my 9th and 10th grade students to understand. I simplified it as: 1) What impacted you from the survivor’s testimony? 2) How did this make you think differently about the Holocaust? and 3) Will this change the way you think about racial and/or religious discrimination? Here is an example of a student who addressed the prompt in her artist’s statement. This picture is based on the life of Bertha Haberfield. She explained how once her family and her had arrived at Auschwitz, there was no time to say goodbye. When she had turned around they were already gone. This picture shows the many lost spirits that did not get a goodbye. Students displayed maturity and great empathy for Jewish holocaust victims, including one who made a heart-breaking connection with a survivor who gave testimony about losing her childhood home. The testimony resonated with this student because her family had recently lost their home due to financial hardship. These young students wrote with great passion and emotion about how much family, friends, pets, and religious freedom mean to them. One student was horrified that Jewish families were required to euthanize their pets five years before they were sent to the concentration camps. Several students wrote about Jewish resistance and declared they would have also resisted even though almost every resistance story ended in death for the Jewish people. The second place art winner (with 64 votes) was a graphic, yet tastefully done drawing of a survivor who endured Nazi eugenics experimentation and forced sterilization. This picture does not really capture all of the fine detail and hard work this student put into the project. These two entries went back and forth all day in the voting. All of the entries were judged by myself and two other English teachers. We picked the top seven in each category. I displayed those on my classroom whiteboards and students walked through this gallery and voted for the top entry in each category. 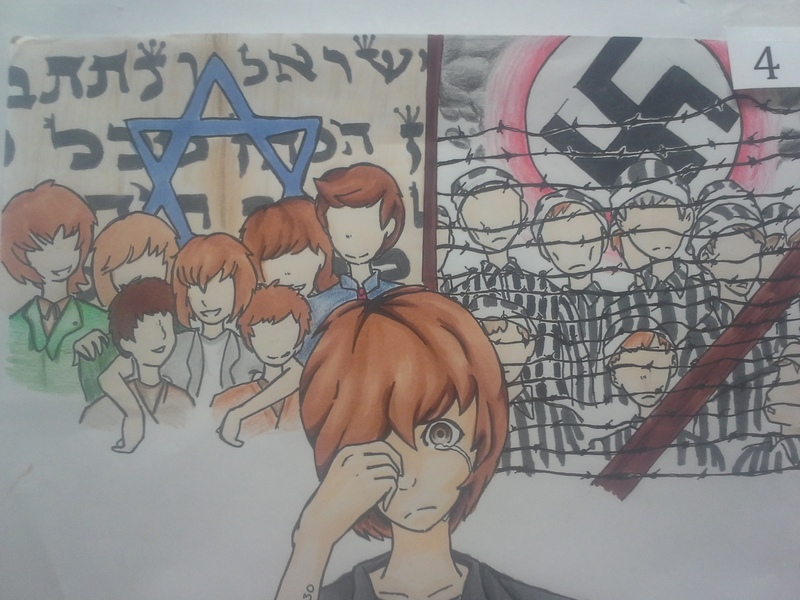 This year’s first place art winner (with 66 votes) was an anime-inspired version of life in a concentration camp. The survivor described pre-war happy, colorful Jewish people practicing their faith and the artist juxtaposed this image with the grim concentration camp inmates. 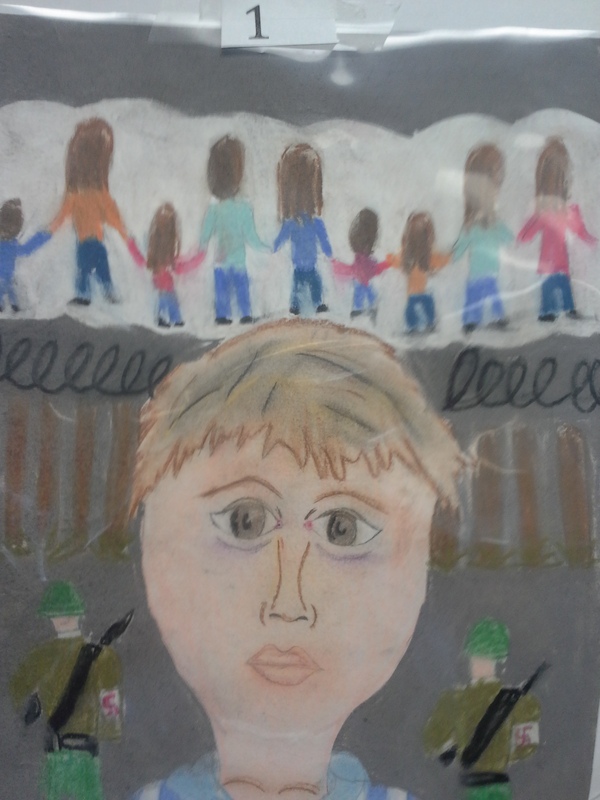 The artist did not draw faces because the Nazi’s did not see their victims as humans, but the survivor who inspired this piece (in the foreground) was admired greatly by this student. Sometimes it is easy to focus on the negative. Teachers are great at this. We beat ourselves up while grading… these kids didn’t get it… they didn’t put enough work into this… these kids don’t care… After reflecting on this project, I realized that the majority of my students do care. They engaged with the subject and created something personal and powerful that displayed great historical empathy. Standardized tests won’t capture how many students made bona fide connections to victims of the Holocaust, but their work speaks for itself. Today, I am proud to be a teacher.